I’ve been sitting in front of this screen for about 15 minutes. Sitting picking at my fingernail (now broken dammit! ), staring at the blank page and wondering where on earth I begin! I’ve neglected this space for over 6 months! My last words here were just before we 3 took off for a wild adventure in Vietnam but in that post, I was focused on sharing all about Wild Ones Issue 2 and had promised to bring all the goods on our travels after our return. I think I might have failed to deliver on that promise! Now here we are, and I’m typing again with my focus all on Wild Ones Issue 3, but simultaneously knowing that I’m skipping past one of the most significant 6 months of my life. I need to write about that! I want to share and I want there to be some record of it here in this Open Journal. That feels important because it’s been huge. Nothing less than life altering and with that, has come massive amounts of challenge and heartache, but all of it essential and worthwhile to get us where we now are and to propel us towards where we wish to go. I’ve fallen way behind in sharing about this latest issue of Wild Ones. Lucky for me, it’s a bi-annual mag so even though this one landed in Nature Play SA member mailboxes just before Christmas, I’ve convinced myself that I can get away with it because we’re still a few months away from Issue 4 rolling out the door. Nature Play SA have changed things up a bit recently, tweaking and making adjustments to better suit the team and all those who support their work - just the way a healthy organisation should! Late last year, instead of the three-tiered membership packages that were available for families, they simplified and merged it all into one terrific membership which, in my opinion, is an incredible bargain when you realise what you get, plus it makes the choice more streamlined and less complicated. A Family Membership gives free entry into all of Nature Play’s major events throughout the year, discount to their boutique events, discount in their shop, exclusive emails and of course, a copy of Wild Ones mag - 2 released each year, one Spring/Summer and one Autumn/Winter. Just to put that into a little bit of perspective, the last time I visited the shop to stock up on craft supplies plus a couple of gifts, the discount I received just about paid for my annual membership! Add in the free entry to 1 or 2 of their major events - Cubby Town or Forest Festival, and you’re way out in front. Happy Days! Everything in the Nature Play shop has been beautifully curated and all items support and encourage screen-free, wholesome, old fashioned nature play. Just check out their latest Catalogue for some serious eye-candy! The book collection alone is enough to have me creating a mile-long wishlist. And just so you know, I’m a loyal contributor to the mag and a huge advocate for their work, I’m not sponsored nor do I receive affiliate kickbacks for plugging their cause ;) Simply put, I just love their work! 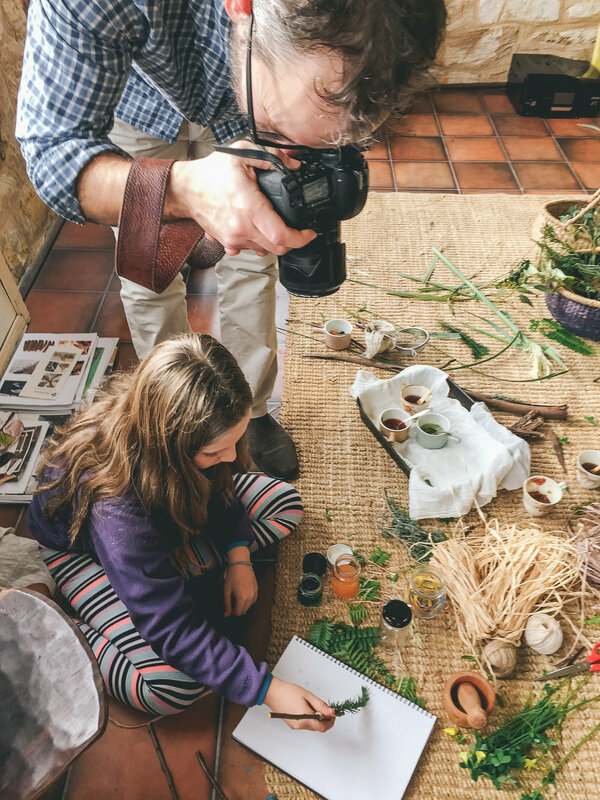 So much work goes on behind the scenes for each issue and a lot of that work can be accredited to Nature Play’s Manager and Wild Ones Editor, Jason Tyndall. Over the past 18 months since my involvement with the first issue began, Jason and I have met a bunch of times to brainstorm article ideas and he talks about the future plans for the mag. We lock down my specific contributions and then of course, set word counts and deadlines. As each deadline approaches we then schedule a photoshoot and crafting day with my kids. We squeeze this in around all the other activities Nature Play have got going on, as well as those that I have going on. Plus the many other photoshoots Jason schedules to cover all the images within the pages. That guy pulls off some crazy working hours, let me tell you. Sometimes I’ve already got my draft written by the day of shoot and sometimes not, it seems to work either way although, for this issue I was very much in the throes of Vietnam prep and apart from organising what we needed for the shoot, I hadn’t written a single word! I found myself taking notes on the day, almost like an inventory of what materials we were using and the most effective method for creating the brushes. You could say I kind of winged it and Jason very graciously allowed for the organic process to unfold. So, with these notes and a heartfelt promise that I would email my write-up to him during our first days in Vietnam, I set about getting that first solid draft done whilst sitting on the plane. Ever the optimist, I also had an audiobook, a collection of downloaded podcasts, my journal and my knitting. You know, just in case I managed to smash out that work with hours to spare ;) Clearly I was also assuming that my 2 kids would leave me to my own desires but considering I was in the middle of the 3 seats, I didn’t stand a chance! Then with all the wonderful yet exhausting excitement of overseas travel and repeated occurrence of dodgy WiFi, I dragged that deadline out! Eeeek a first and let’s hope the last time that ever happens! Finally though, sometime during our second week of travel and during one of our ‘splurge’ accomodations with reliable WiFi, I got that draft tidied up and clicked send. So even though I’ve already expressed my gratitude, I’m eager to say another big fat THANK YOU to Jason! He’s a pretty great Editor to work with, not to mention extremely patient and accommodating!! I’ve been doing so much writing and reflecting on last year and making some pretty exciting plans for this year so bare with me while I put all that into some kind of coherent form. I reckon my next post could be a juicy one!